On the Orange Carpet at the 2019 Kids Choice Awards! Stars such as Will Smith, Josh Peck, Noah Centineo, Lana Condor, Joey King, Isabella Moner, Candace Cameron-Bure and more hit the orange carpet at the 2019 Kids Choice Awards this year. PopEntertainment was lucky enough to be he invited to this show that is known for pouring buckets of slime on some of the industry’s biggest celebrities. The show was held at USC’s Galen Center in the heart of Los Angeles, California. DJ Khaled was the host of the kids-voted show this year (along with co-host Jojo Siwa) that hands out awards for movies, music, TV shows, video games and more. It was a star-studded night indeed. Some of today’s biggest stars showed-up for the kids, looking their best as they walked down the Orange Carpet. The big question on everyone’s mind was who might get slimed this year and hoping it wouldn’t be them. After all of the carpet arrivals, everyone headed in for the main event! The show got started with the host himself DJ Khaled arriving to the awards ceremony by yacht and helicopter with a little help from a few of his friends – Kylie Jenner and The Jonas Brothers. You could feel the excitement illuminate the building as Khaled finally stepped out on stage to get the sea of children pumped-up for the slime-tastic event. The evening was full of surprises, which included sneak-peeks from some of this Summer’s most anticipated movies! This included an exclusive look at the live-action Disney adaptation of Aladdin, which will hit theatres this May. Will Smith, Naomi Scott, and Mena Massoud descended on a “magic carpet” and interacted with the audience of kids encouraging them to make wishes, which resulted in a huge slimming for them and Will Smith. We also got a glimpse of Dora and the Lost City of Gold which is a live-action take on the original cartoon series, Dora the Explorer. The film will star Eugenio Derbez who plays a mysterious jungle inhabitant, along with co-stars Michael Pena and Isabela Moner, who plays Dora. Another big unveiling was a short clip of the upcoming movie Shazam! Which is set to hit theatres April 5th. The star of the show Zachary Levi started on screen and then appeared on stage as quick as lighting with the word “Shazam” and a little help from the audience and pyrotechnic team. This year’s ceremony was also full of musical performances. Two of the main highlights was a performance by The Migos’ hat brought down the house and a SpongeBob musical number who had the kids in the audience in a frenzy! 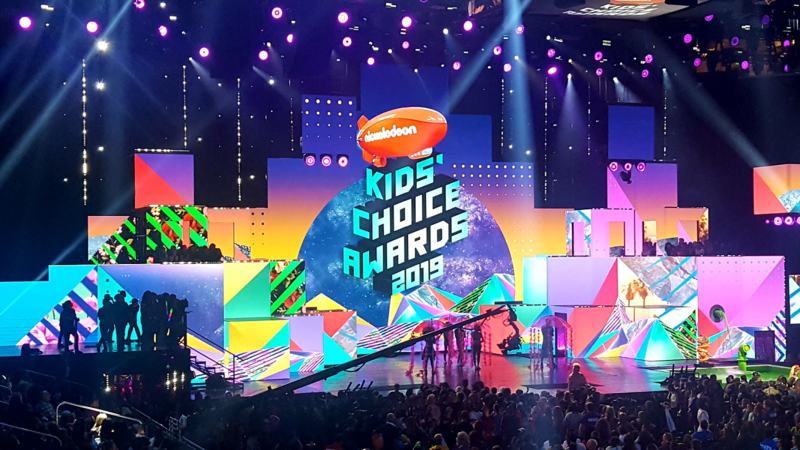 Even during commercial breaks, the party continued with Nickelodeon’s famous orange blimps floating around inside the auditorium, while Nickelodeon crew members threw Kids Choice Awards T-shirts into the audience and encouraged everyone to dance and keep the energy going. By the stage many celebrities mingled and took time to take pictures with their young fans in the audience. While crew members hurried to reset and clean up any excess slime off the stage. Among the big winners were Ariana Grande, Shawn Mendes, Adam Sandler, and Avengers: Infinity War was named favorite film. Please continue reading for a full list of Winners. And please make sure to follow us on Instagram and Twitter for more of the Kids Choice Awards 2019 and other exclusive content. Copyright ©2019 PopEntertainment.com. All rights reserved. Posted: March 25, 2019. Photos ©2019 Bryan Rodriguez and Lindsey Blick. All rights reserved. Tags: 2019, adam sandler, Aladdin, Ariana Grande, Avengers: Infinity War, Bryan Rodriguez, Candace Cameron-Bure, DJ Khaled, Dora and the Lost City of Gold, Dora the Explorer, Eugenio Derbez, Isabella Moner, Joey King, JoJo Siwa, Josh Peck, Kids' Choice Awards, Kylie Jenner, Lana Condor, Lindsey Blick, Mena Massoud, Michael Peña, Migos, Naomi Scott, nickelodeon, Noah Centineo, Orange Carpet, Shawn Mendes, Shazam!, SpongeBob, the jonas brothers, will smith. Bookmark the permalink.